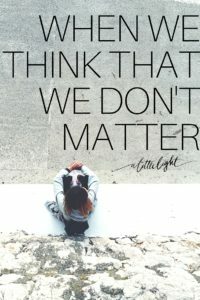 What happens in our lives when we think that we don’t matter? This is a belief I have lived with most my life. It was a belief I didn’t even know I had for thirty years. It took learning the Enneagram to reveal to me that I operated under this assumption; I don’t matter. When we live with the belief that we don’t matter it causes us to stay under the radar, make fear-based ‘safe’ decisions, watch opportunities pass us by because – how could they possibly be for us? It weakens our muscles and quiets our voices. 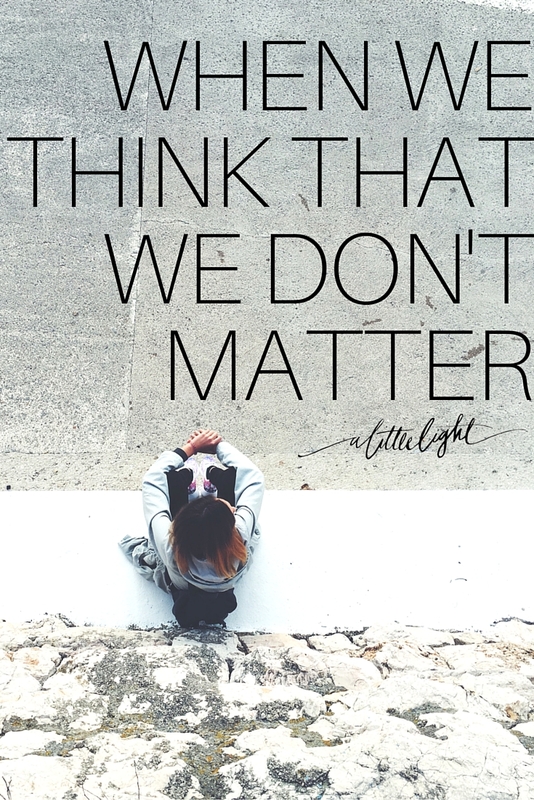 When we think we don’t matter we are turning off the light inside and looking to others to shine the way for us. I suppose there are baby steps we make throughout life, reaching for that light switch. Waiting for permission to turn our light on. Perhaps we even pick up our little light and carry it to an empty corner and light it, just to watch it’s colours flicker and shimmer. Perhaps we wonder why God gave us this little light, how could the world possibly need our one tiny light? Especially when so many others radiate and sparkle across the landscape. Who wants my light, it doesn’t matter. Oh friend, it matters. God doesn’t make women who don’t matter. You matter. Your story matters, your voice matters, your laughter, your hands, your interests, your friendship, they all matter. They matter to God. Because God doesn’t make people, with hearts full of dreams and hands full of skill and mouths full of stories for no reason. Believe this, that you are his image bearer and he wants you to shine. Believe that God has made you to shine for his glory. And the pressure isn’t on you, all you need to do is take steps of obedience and his grace (not our skills) will ensure our light shines for his glory. Recently, one of our community members started her blog – from her hospital bed where she is on bedrest. She shared some thoughts on being ‘one more blogger’, a mindset that stops so many of us from pressing publish. The world may have plenty of blogs, but there is always someone who needs your story no matter how you share it. Your story is His story and he made you especially unique to tell it. You may share similar circumstances with someone else, but your story will always be one of a kind because of the things you have experienced, the audience who is listening, the tone you take, the insight you garner, and the values you view it through. Besides, aren’t we all telling the same story over and over in many ways – just like in the bible? The story of hope, grace and endless, forgiving love. So remember this ladies, you matter to the Kingdom of Heaven. You were made to be a story-teller, a hope-sharer, a joy-giver, a dream-chaser, a light-bearer. Don’t shut your heart off or your voice off because someone else needs you to shine a little light on their path so they can find their steps towards hope, grace and endless, forgiving love. Woman, you matter. So step out and live like it. Whoa…. Holy Spirit timed words right here. Thank you for writing them. I have a couple online things (blog and Bible study) and had baby #3 almost 6 months ago. Wrestling with what obedience looks like in this season as for me writing well takes time I can’t seem to find in the day while constantly noticing the many who do write and minister well online and silently wondering if it matters. Thanks for the reminder that it does because it’s another chapter of His story. Just found and followed you on Instagram. Excited to be part of this community! Ah, you sure aren’t alone! Thanks for commenting 🙂 and welcome to the community.